Following a nationwide slowdown in the Canadian Real Estate sector, home sale activity declined 11.3% year over year in April, it appears Canadian banks could soon feel the pinch. One of Canada’s more aggressive mortgage lenders, CIBC, announced it expects new mortgage originations to fall roughly 50% in the back half of this year. CIBC’s Canadian retail banking head Christina Kramer said new policies such as the mortgage stress test are having an impact on sales of mortgages. While CIBC still expects their overall mortgage portfolio to grow in the low single digits during the second half, compared with 7 per cent in the latest quarter and 9 per cent in the previous quarter this slowdown in mortgage growth has much wider implications on CIBC and the Real Estate market moving forward. CIBC has been chips all in on Canadian Real Estate. As of Q3 2017 their uninsured lending growth reached 12% growth year over year, That’s nearly triple the industry average. Canadian mortgages as a percentage of their total loan book makes up about 60% per recent data. 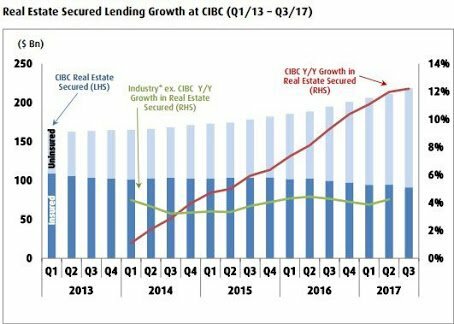 More recently, Q1 data shows CIBC’s residential mortgage portfolio rose to $203 billion in Q1, up from $201 billion in Q4 and $186 billion in Q1 2017, or 9% year-over-year. Of the $203-billion mortgage portfolio, $28 billion is from the Greater Vancouver Area(up from $25 billion a year earlier), and $63 billion is from the Greater Toronto Area (up from $52 billion in Q1 2017). Both markets are experiencing more pronounced declines in sales activity. Greater Vancouver had sales drop 27% year over year in April, with Greater Toronto sinking further by 32% year over year. If CIBC is reporting a huge drop, surely other banks will be too. In the bigger picture, this highlights how important the Real Estate market has been for the big banks and the reliance of residential mortgage loans to drive growth. With the Bank of Canada reporting mortgage credit growth having decelerated to it’s lowest clip in nearly 20 years and mortgage originations expected to drop rather dramatically, this will have wider implications moving forward. Keep in mind banks create credit at the click of a button, thus creating money and purchasing power at the same time. Fewer mortgage loans created is akin to cutting purchasing power and money creation, both of which play a critical role in stimulating nominal demand growth. In simpler terms, when banks scale back mortgage credit it has a direct impact on housing and economic growth.